Commercial drywall is a thriving industry for many reasons, and companies seeking out new ways to improve workplace productivity is one reason that seen a considerable increase in the decade. Investing in the welfare of your employees can be a very lucrative decision, as recent studies have pointed toward workplace satisfaction and productivity as the best means for ensuring pride and quality in your work. The layout and design of your office can play a major role in the overall productivity of your employees. Cramped, dark spaces can create a lack of motivation while bright, sunny spaces encourage more creative thinking and drive. While investing in this sort of improvement for your facility can be a major undertaking, taking the time to find the perfect commercial drywall company for the job can provide big returns. AZ Drywall Finishing is proud to be your team of drywall contractors in Chicago, relying on decades of experience to provide the best outcome for your project. We’re dedicated to creating long-lasting and cost-effective solutions for each site we work on, and our drywall company is here to deliver the best to your business. While renovating a commercial space may not sound that enjoyable, the long-term benefits of doing so may result in major benefits for your operation. 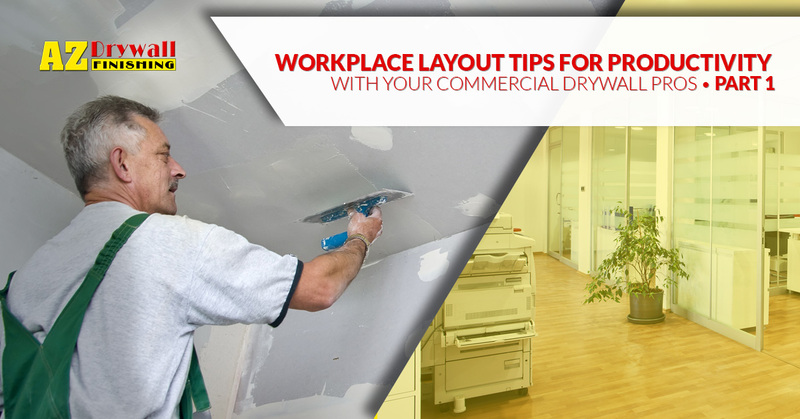 Today, we’ll highlight a few tips that may help you in deciding the layout and budget for your drywall installation needs. If you are currently looking for a drywall company in Illinois, be sure to contact us for a speedy quote! While the specifics on how to directly improve workplace efficiency are still being studied, ample evidence has been produced that points to employee satisfaction as a top cause. Creating a workspace that makes people happy will provide a wide range of benefits to your facility. Installing drywall and updating features, when done correctly, can serve as a cost-effective way to improve the experience for everyone who works in the building. Below are a few key considerations that may help you in your planning process. From effectively laid out floor plans to acoustic ceiling tiles, there are numerous ways to create a quieter space for your employees and guests. Studies have shown that introducing more audio stimuli into a situation that already holds intensive cognitive processes can result in costly interruptions, with more susceptibility to distractions and a longer timeframe needed to restart on the tasks at hand. Even smaller companies face challenges with sound control, as today’s world is full of noises and distractions. From the salesman pacing by your desk loudly discussing brass tax on the phone to footsteps and dropped items on the floor above, the potential exists for serious disruptions. Designing your floor space to minimize sound’s ability to travel can create a quiter workspace that sees fewer distractions and better output. Our commercial drywall contractors have helped to create amazing spaces that include acoustical features that create a quiet, productive office. Everyone feels better when they have an area that is designated for relaxation, and introducing a new space that is purposed for letting off steam can help you and your employees to thrive. While your company may not opt for “nap pods” for relaxation, small measures can create big benefits. Today’s employees want a place where they can relax and reset before getting back to the grind. Everyone is different, so be sure to plan for an area that provides multiple functions. While some employees may need a comfortable spot to eat lunch and catch up with coworkers, others may simply need a spot to read on breaks or to rest their eyes. Company synergy should be present at all levels of the business, and incorporating a relaxation area can prove to be a cost-effective way of improving employee morale and productivity. Your designated downtime zone can be any size and include any range of amenities, just be sure to focus on the wants and needs of your team. Creating a floorplan that motivates humans to work harder may sound like a challenge, yet taking the time to plan ahead can help you to create a cost-effective outcome that can make everyone happier, from new employees to the owners. Next time, we’ll continue this topic by discussing a few more ways you can renovate your business to enhance workplace productivity. As Chicago’s go-to drywall contractors, AZ Drywall Finishing is here to help you create a beautiful space that perfectly fits your goals and budget. Contact us today to receive a quote for our commercial drywall services!